Once a month, on the first Sunday of each month, our all-age family service includes a time of communion, sharing the bread and the wine as Jesus instructed ‘in remembrance of Me’. All those who are old enough to have made their own personal decision to follow Jesus, and are living a life in obedience to Christ and His Word are welcome to participate. The bread symbolises Christ’s body, which upon the cross became subject to the wrath of God. Christ willingly stood in our place to receive the judgment from God we were due. When we eat the bread, we are openly identifying ourselves with Jesus in the same way the Levitical priests would lay their hand upon a lamb they were about to slay, knowing that the lamb’s death was judicially in place of their own. 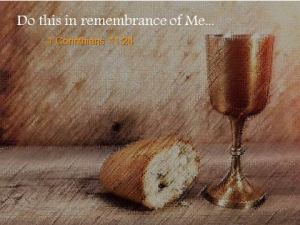 In the taking of the bread we therefore remember Christ’s sacrifice. In the book of Leviticus we are told “the life of the flesh is in the blood” (Leviticus 17:11). Blood speaks of life; it is actually blood which defines that which has life (as opposed to things like plants etc. which, whilst living are not ‘alive’). In shedding His blood for us, Christ in effect purchased-back (redeemed) our lives. God had stated that the punishment for sin was to be death (Genesis 2:17 /Ezekiel 18:20). All mankind has sinned (Romans 3:23) so all mankind was spiritually dead. But when Christ died for us and His blood was shed, a ‘legal’ transaction took place where God accepted Christ’s death in place of ours – thus God’s justice and mercy were both satisfied in the one transaction. To us now, if we have accepted Christ’s death in our place and put our trust in Him, the blood of Christ speaks of new life, an unmerited and undeserved second chance. In the taking of the cup we rejoice in the new life we have been given. This is why communion is such an important reminder of our ‘so great a salvation’.